A great many Popes have published numerous official Church documents on the Rosary, and this website has relied upon (and quoted excerpts from) two in particular: Pope Paul VI's 1974 Apostolic Exhortation Marialis Cultus and Pope Blessed John Paul II's 2002 Apostolic Letter Rosarium Virginis Mariae. The links at the left will take you directly to the Vatican website's official English language translations of these important documents. The Fisheaters website contains a treasure trove of traditional Catholic prayers and devotions. It also boasts one of the most complete and accurate histories of the Rosary we have seen (click here to go directly to their Rosary page). There is a site search engine in the top right corner of their home page, and a very complete site map as well. 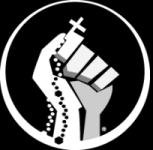 Real Men Pray the Rosary is an American based apostolate that promotes devotion to the Rosary among Christian men. It has a great deal of information about the Rosary, and some pretty nifty gear you can buy in their online store. The official website for the Confraternity of the Most Holy Rosary allows free, online enrollment in the Confraternity. Members will receive a Certificate of Perpetual Membership, and are obligated to fulfill the requirements of membership: namely, praying the entire traditional Rosary (i.e. at least the Joyful, Sorrowful and Glorious Mysteries) at least once a week. Ranger Rosary is the official website of the U.S. apostolate that provides volunteer made combat Rosaries to American troops. Our own Rosaries for Canadian Forces Abroad apostolate does the same thing for deployed Canadian Forces members and their families. Project 59 Canada is based in the Archdiocese of Toronto. As a Private Association of the Christian Faithful, we operate independently of the Archdiocese, while still pledging fidelity to the Magesterium of the Church and obedience to our Bishop. Bishops have extraordinary burdens; please, in your charity, pray for our Archbishop, Thomas Cardinal Collins, and his Auxiliary Bishops. Age of Mary is an amazing resource for all things pertaining to Marian devotions, including a wealth of information on the Rosary, the Little Office of the Blessed Virgin Mary, and total consecration to Jesus through Mary. To learn more about how to worship God through Jesus and Mary, visit this site.